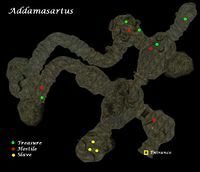 Addamasartus is a small slavers' cave immediately to the northeast of Seyda Neen. This cave is home to a gang of three low-level slavers and smugglers, their three slaves, and a rat. It is an excellent place for new adventurers to get a feel for both combat and underwater exploration. If you chat with Eldafire in nearby Seyda Neen, she might ask that you do something about the smugglers located here. It seems that she feels the guards in town are turning a blind eye to the problem. The trader Arrille will also mention them when he is talking about "practicing your skills" on outlaws. All of the smugglers in this cave are hostile and will attack on sight. One of them is a spellcaster and another has a ranged weapon. There is a hidden chamber in the cave that can be reached along two routes: by entering the gate at the back of the inner chamber and swimming through the water (also look for a skull and a Standard Rising Force Potion in the bottom), or by traversing the rocky ledge immediately to your left when looking out from the slaves' pen. In this chamber, you'll find a cave rat and the bones of a corpse. On the corpse is some armor and a few gold coins. There is a Thief Ring near the ribcage; crouch, look carefully, and use a torch if you can't spot it. If you still can't, look for the rib cage and two long bones amid some mushrooms, then imagine lines running from the bones and the ribcage; where the ribcage line forms a 90-degree angle with one of the long-bone lines is where the ring lies. 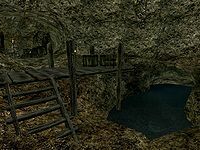 If you dive into the water next to the platform where smuggler Melar Baram was located and pass through the submerged tunnel, you'll emerge in a chamber with a rusted chest to your left containing a few drakes and random loot. A corpse, a fishing pole, and an Iron Saber (a cheap but comparatively high-damage starter weapon) are at the bottom of the chamber. There is a fair amount of Moon Sugar and Skooma in the smugglers' loot. Be warned: you won't be able to deal with the more reputable merchants as long as you have either Moon Sugar or Skooma in your possession (though you can drop it on the floor in front of them without objection). However, this contraband can be sold to a few (mainly Khajiit) merchants and alchemists in various towns (the most convenient is probably Ra'Virr in Balmora). In addition, Moon Sugar can be used in a few useful alchemical recipes. 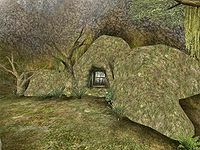 The three slaves you free in this cave count toward the twenty slaves you need to free to receive the code phrase and unlock the Twin Lamps quests from Ilmeni Dren. There are two keys that will allow you to open the slaves' bracers and the locked gates in this cave. One can be found on Tanisie Verethi, the other on a crate next to the water on the northern side of the cave. New player tip: This may well be your first cave fight, and the spellcaster in here can kill the average level 1–3 PC with a single Fire Damage spell, which can be frustrating. It helps to use a ranged attack on him from a distance (using Invisibility right before you leave the first cave chamber will give you a free shot on him from the central area; you'll see him standing on a wooden platform on the lower level). Resist Fire (or Fire Shield), Reflect, and Fortify Health magic are helpful when facing him at close range; these are most easily obtained, at a low PC level, in the form of fairly cheap potions and scrolls, available from merchants in towns, forts, and Mages Guild locations. Facing him head-on is also good practice in working out how to side-step magical attacks so they just miss you completely. This page was last modified on 8 September 2018, at 03:42.